Pig's last day in their current home is Sunday, April 21st, and we're going out with a bang! After your morning egg hunts and Easter celebrations, come in any time on Sunday between 11am-8pm for hourly food specials, $15 pitchers of ANY beer, flip cup, and other games. Upon departure, take a piece of this beloved space home with you by choosing your very own pig from our vast collection. There is no ticket required for this party, just come to eat, drink, and be merry! Following Sunday's party, Pig will be closed and will be on a short hiatus as we move all our equipment out and break in the new space. We are planning to re-open early-mid May. Stay tuned, Piggy fans! The future looks tasty! 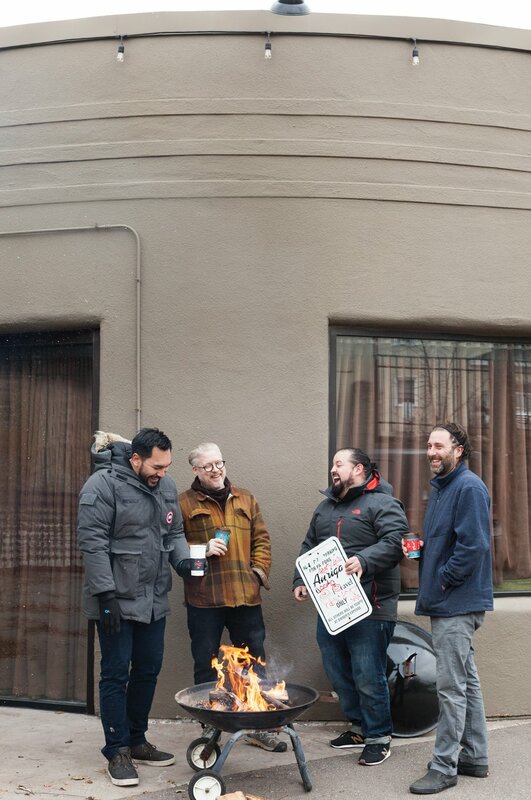 In case you need a refresher, Pig is clearing out our home at 4154 Broadway and moving down the street to totally renovated digs at 4124 Broadway (where the old Travail used to be). We're introducing a refreshed food menu (complete with fan favorites), a souped-up bar program including cocktails, and our first ever microbrewery concept with a new ticketed brewer's tasting menu experience. The best part about our in-house brewing is that you'll always have the perfect beer to pair with your meal because it's made by the same Travail Collective chefs who helped develop those flavors you've come to know and love. As our brewing equipment gets up and running, our taps will be flowing with a series of exclusive collaboration brews we've been working on with local legends like Surly, Dangerous Man, and more. At our new house, there will be plenty of space for everyone. Get some fresh air in our Minnesota-screened-porch-inspired dining area with big garage door style windows that'll be open for those warm weather months. You'll notice that we have more seating overall including at the new bar, meaning it'll be easier for you to get in and get to nomming on that hot za asap. We'll also have a to-go area with crowlers and merch so you can share the piggy love at home and on the go. More details are to come, Stay tuned and we look forward to this next chapter with you! Starting at the end of March, Travail will be hosting its second concept at the Minneapolis residency: Homage, a collaboration with chef Doug Flicker inspired by the fine dining scene in the late 90s. Flicker and his colleagues opened Auriga in 1996 (in the very space that our residency resides now) where "a common sense approach to cooking” was “worked and re-worked to uncommon sophistication". After Auriga closed in 2007, Flicker went on to create nationally recognized Piccolo, opened seasonal favorite Sandcastle, holds meat raffles at his dive bar Bull's Horn Food and Drink, and also leads the culinary program at Esker Grove. He helped put the Twin Cities fine dining scene on the map and influenced many of the chefs and restaurants that exist in the area today. He’s a long time friend of Travail, and even worked with two of Travail’s owners, a young James Winberg and Mike Brown at Porter & Frye, where the two originally met. Travail’s second concept Homage will bring back the 90s fine dining scene in all its glory with a coursed menu in collaboration with Doug Flicker himself. We’re going the whole nine yards back in time with white table cloths, floral arrangements, and even white chef coats. But don’t worry, there will still be that familiar Travail exuberance served with every course. This MSP Mag article by Stephanie March said it best: "You can watch old movies and read books to understand an era. But it’s a rare opportunity to taste some of the food. Plenty of young guns, working in kitchens now, weren’t even alive in 1996. I hope they see this fine-dining flashback as their chance to pull up a chair to history." Dinner will be an 8 course tasting menu inspired by progressive, influential chefs who shaped fine dining in the 90s. Find flavors like a Thomas Keller Beef Tartare, a Georges Blanc Bresse Chicken, and a Doug Flicker Beet and Goat Cheese Ravioli, plus more inspiration from the likes of Michel Bras, Trotter, Robuchon, and Jean George to name a few. You'll also enjoy amuse bites inspired by local legends like Steven Brown, Jack Reibel, Michelle Gayer, Lenny Russo, Alex Robert, and more. Dress up your tasting menu experience with a ridiculous dinner supplement package including osetra caviar, foie gras, wagyu strip loin, Japanese amberjack, truffles, and langoustine for $120 per person. For all the wine lovers out there, we'll have wine pairing tickets for $100/person including six/seven pairings with your dinner highlighting our favorite wines from Beaujolais, Burgundy, and California. Both of these upgrades are available within the ticket purchasing process. Prices are before tax and service fees. The bar will be open serving an a la carte throwback Auriga menu including plates like Goat Cheese Antipasto, Risotto with Wild Mushrooms, the return of the legendary Catalan Fish Stew, and Polenta with Scrambled Eggs. We will also serve beer on tap, wine by the glass, and craft cocktails including new recipes inspired by Auriga and all things 90s. Open Wed-Sat 5-11pm, no reservations needed. The Homage concept will run from the end of March through May. Note: Tickets are sold in even quantities and are priced per person. If you are not seeing availability, check that your party size is set to 2, 4, 6, 8, etc. Last week our team moved everything out of our beloved Robbinsdale home and now we're officially open in our new Minneapolis digs for the next six months. We are thrilled to be hosting our first round of guests this week and can't wait to share a whole new chapter of UMAMI, sake bombs and all. As a reminder you must have a ticketed reservation for the UMAMI tasting menu, however the bar is first come, first served open seating. Located in the old Bradstreet location next to Lowry Hill Meats. We're offering a full cocktail, beer, and wine menu plus a smaller a la carte menu playing off UMAMI flavors and pub fare favorites including wings, a burger, ramen, bao, bún salad, and more. We have a whole new lineup of cocktails just for UMAMI that you won't want to miss! All seats will be available on a first come, first served basis. You may also take your nibbles to go. February and March UMAMI tickets will be available for a member pre-sale on January 15th, and will be available to the general public on January 16th. The full run of ticketed reservations for the following concept (90s Fine Flicker running late March-May) will be available at the end of January. A pre-sale will be available to Travailian Local, Plus, and Prime members on Tuesday, January 29. Tickets for the general public will be available on Wednesday, January 30th. 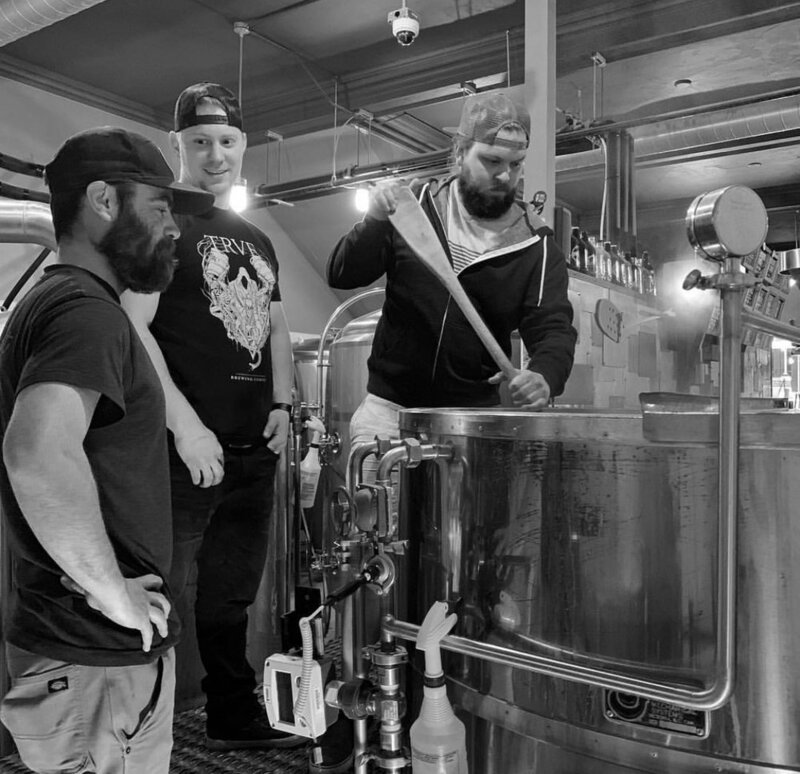 We headed downtown this week to smell the hops and get the inside scoop on an all new secret brew collab between Modist Brewing and Junkyard Brewing. Each team will craft the same recipe at their own facilities, allowing for the variance in process and location to make two unique batches. Be the first to sip these tasty collabs at our upcoming beer release tap takeover on January 27th. Modist and Junkyard will bring a whole slew of suds to takeover our taps for an evening of bottomless brews and all-you-can-eat Pig pizza and passed plates. Win swag in raffles and games, hang with the brewers themselves, and take home a FREE tasting glass. *Pig will be open for brunch that Sunday morning from 11am-1pm. Happy 2019 Travailians! 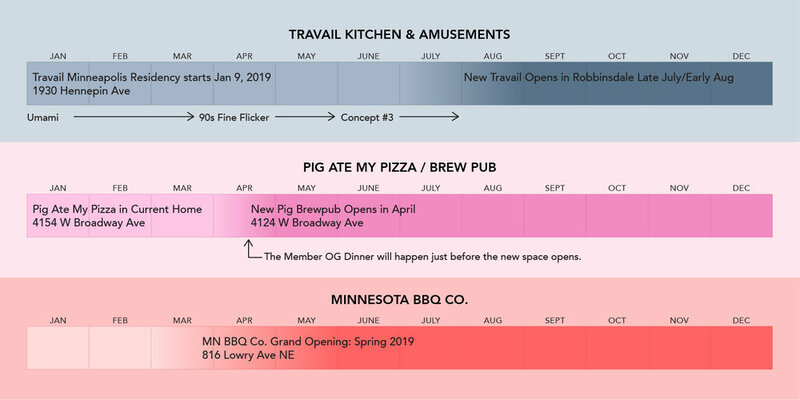 Things are really starting to move and shake in the Collective, and we wanted to give you an update on all our latest projects like the construction on Travail 3.0, the new Pig Ate My Pizza brew pub, and the opening of Minnesota BBQ Co.
Below is our latest timeline for each restaurant concept. Please keep in mind that everything is relative to construction timing and these are estimations of when things will happen. We’ve also included a few notes for our Travailian members of when they can expect certain perks/events to happen. We are officially out of the old Travail space in Robbinsdale (4124 W Broadway). It took 20 chefs and 12 hours to move out of the 10,000 square foot space. Some stuff went into storage for the new Travail, and much went to be utilized in our new temporary home at 1930 Hennepin Ave in Minneapolis. Come on in and visit us starting January 9th for our Umami concept! If you don’t have ticketed reservations, we’ll have a phenomenal bar menu that will also be available as take-out. As far as the old space goes, renovations will begin soon to make way for the new Pig Brew Pub. Meanwhile, construction is underway on Travail 3.0 in Robbinsdale, and we look forward to bringing you more updates and photos as that project progresses. Framing is going up this week - whoop whoop! Minnesota BBQ Co. is slated to open this Spring. We are hoping to line up a few pop-ups or events to get some of that juicy Q in your hands in the mean time, so stay tuned and we thank everyone for their continued patience and endless excitement for this project to come to fruition! We’re working closely with our vendors and the city to make sure everything is on point for our grand opening. And lastly, but definitely not least - all is well at Pig Ate My Pizza. We’ve been scheming up and tweaking some beer recipes for the new brewpub that we can’t wait to share. In the meantime, our Pig crew is slinging that familiar amazing pizza that you know and love, so go get your comfort za while you still can in their current space before they move out in the Spring. And look out for some lunch and dinner specials as part of Restaurant Week in February! Starting at the end of March, Travail will be serving its second concept at the Minneapolis residency: 90s Fine Flicker. Chef Doug Flicker ushered in a new era of fine dining in Minneapolis in the 90s with his legendary restaurant Auriga, and later went on to create Piccolo and Esker Grove. He helped put the Twin Cities on the map as a food destination and influenced many of the chefs and restaurants that exist in the area today. He’s a long time friend of Travail, and even worked with two of Travail’s owners, a young James Winberg and Mike Brown at Porter & Frye, where the two originally met. Travail’s second concept will bring back the 90s fine dining scene in all its glory with a coursed menu in collaboration with Doug Flicker himself. The chefs will be serving a pre-fixe menu inspired by the 90s fine dining scene and influential chefs from that time. Special beverage flights will be also be available, which will include juice, wine, beer and other styles of beverage curated to complement the current menu. Ticketed Reservations and pricing will be available at the end of January 2019. Member pre-sale tickets will be available January 29. General public tickets will be available January 30. Similar to Travail now, we will offer a full cocktail, beer, and wine menu plus a smaller a la carte menu. All seats will be available on a first come first served basis. Orders will also be available for take out. 2019 brings lots of exciting changes, starting with a Minneapolis residency. In January Travail will be moving into a temporary home at 1930 Hennepin Ave in the great 55403 zip code. This address may ring a bell for those of you who have dined at Bradstreet Crafthouse, Rye Delicatessen & Bar, or the legendary Auriga. 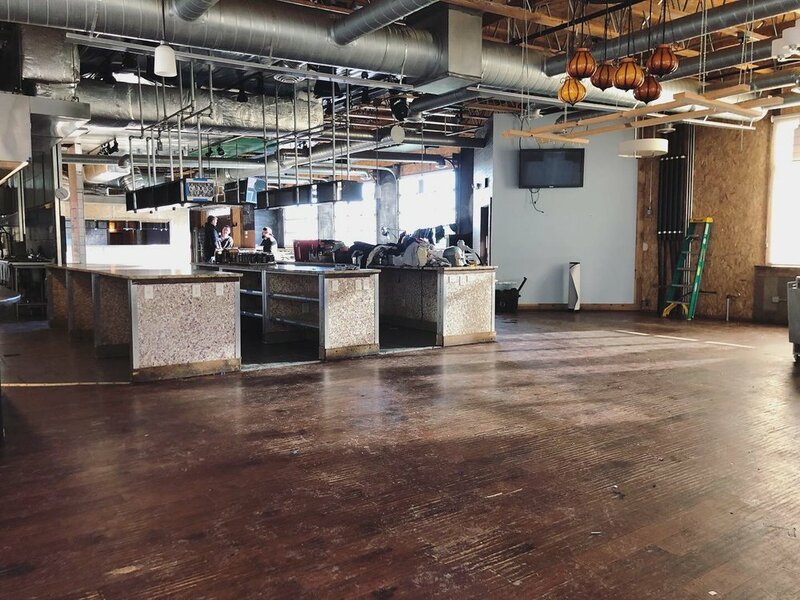 Construction is already underway for Travail to return to Robbinsdale in the early summer, and the current 4124 Travail building will be undergoing a remodel into the new Pig Ate My Pizza brew pub slated to open late spring of 2019. But let’s get back to being in residence in Minneapolis. We plan to be hanging on Hennepin for the first six months of the year bringing you three different concepts, each lasting about two months. Those of you who are fans from WAY back remember the first time we hit the road while building a new space: UMAMI by Travail, where we turned a fried chicken joint in NoMi into a pre-fixe meal featuring some of our favorite asian dishes and flavors. Well, it’s back! 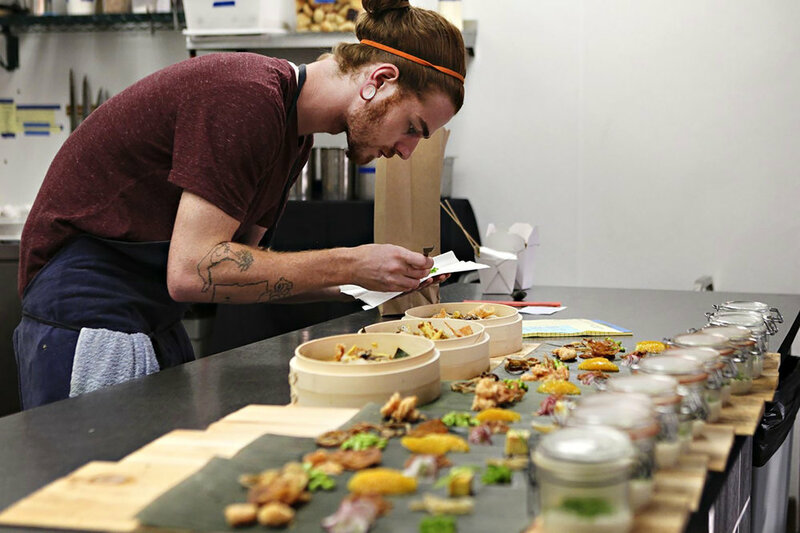 UMAMI will be the first concept at our Minneapolis Residency. Here’s what you can expect…. Our chefs will be serving a pre-fixe menu including Dim Sum cart service, shared family courses, amuse bites, sake bombs and more. Special beverage flights will be also be available, which will include juice, sake, wine, beer and other styles of beverage curated to complement the current menu. There will be 4 seatings per evening. Ticketed reservations are now available on our Tickets & Events page. Similar to Travail now, we will offer a full cocktail, beer, and wine menu plus a smaller a la carte menu. All seats will be available on a first come first served basis. During the UMAMI run, we will likely have items such as ramen, dumplings, wings, and tonkatsu donburi. AND… these treats will also be available for take out. WELCOME TO THE NEW TRAVAIL COLLECTIVE. Yes, we're tearing down the blighted building at 4131-4135 W Broadway (across the street from the current Travail) and creating a new experience-fueled two-story space in the heart of Robbinsdale. Redevelopment plans include a rooftop patio overlooking the city (for one-off events like outdoor movie screenings and chef spotlights), artist collaborations, and a playground for all of our wildest ideas. We’ll still have four nights of ticketed reservations each week, but at these dinner parties, our new home will be your home. Eat as much as you want, drink as much as you want, laugh as loud as you want, and stay as long as you want. Pig Ate My Pizza needs more space. If only we had a big empty building with kitchens and walk-in coolers and…oh wait, Travail’s moving out of 4124 W Broadway, let’s put Pig there! And with room to spare, we’re putting in a chef-driven brew pub and a real Minnesotan screen porch. We’re reviving the tasting menus, adding seatings for ticketed reservations (to accommodate large parties), beefing up to-go ordering including crowlers, expanding small plate selections, and bringing back some of your favorite throwback ‘zas. What happens when chefs brew their own beer and pair it with their own culinary creations? A match made in numnum heaven, duh. We know, we know... you've heard rumblings of this for a while now (and maybe you’ve even had a few tastes of Kale’s MN BBQ at breweries and pop-ups) but the time has come for the smoke to reign down in the heart of the NE brewery land. Minnesota BBQ Company is the food baby of Chef Kale Thome, a native of Wichita, KS and an OG Travailian. That is to say, this ain’t his first rodeo! Anyone who’s tried his mac and cheese or brisket sandwich will agree, he has a special way with that smoker. At this very moment, Kale and crew are wearing their tool belts and finishing up the final renovations on the new space. We’ve built a custom proprietary smoker where all these glorious meats will spend many hours basking in the oak wood smoke. Not only does this damn tasty Q capitalize on some of the greatest barbecue traditions, it is also influenced by Minnesota products and culture. The new space will be small, but mighty, offering take-out and delivery to the nearby breweries. Come fill your bellies, dirty your fingers, and ease that hanger when we open towards spring 2019.